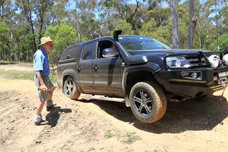 The Advanced 4WD Driver Training Programme is available for those persons that have completed their Introductory Training or who can demonstrate that they have achieved this level through prior learning. It includes advanced levels of wheel placement, very steep inclines and declines, mud driving, water crossings, rocky terrain and actual hands on vehicle recovery techniques to an advanced level. Great Divide Tours owns an exclusive property on the outskirts of Braidwood in the Southern Highlands of NSW. Just 3 hours drive from Sydney, 2 hours from Wollongong and 1 hour from Canberra it is ideally located for easy access. This property has been developed with four wheel drive training in mind. Fully approved by Council this is a sate of art training facility. It is in a picturesque bushland setting typical of the type of terrain that you are likely to encounter when using your 4WD. The nearby town of Braidwood provides fuel, supplies and accommodation. Camping on the property is included in your training fee cost.